Radiography of the hand showed no abnormalities (not shown). MRI revealed an oval 1.3-cm mass in the volar subdermal tissue immediately superﬁcial to the ﬂexor tendons of the second digit (Figure 1). 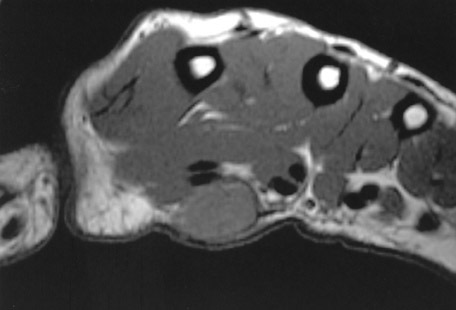 At the time of excision, gross pathologic analysis revealed well-encapsulated tan tissue (Figure 2). No areas of hemorrhage or necrosiswere noted. Histologically, the lesion was nodular, and there was differentiation toward the adnexal ductal epithelium with chon dro myxoid and adipocytic differentiation in the stroma. A chondroid syringoma is a rare mixed tumor of sweat-gland origin that has both a benign and malignant form.1,2 The term chondroid syringoma was introduced by Hirsch and Helwig in 1961 because of the cartilaginous matrix (chondroid) and sweat-gland elements (syringo-ma).2,3 They usually are adherent to the skin and should have no attachments to the deep structures.3 Up to 80% of benign lesions occur on the head or neck and usually occur in adults >35 years of age.1,3 These tumors have a reported male-to-female predilection ranging from 2:1 to 5:1. At the time of removal, the tumors are typically ﬁrm, circumscribed whitish-yellow nodules. Histologically, the tumors contain varying amounts of: nests of cuboidal/polygonal cells, tubuloalveolar structures, ductal structures, keratinous cysts and matrix (chondroid substanceis the most prevalent).2 On samples from ﬁne-needle aspiration biopsy, there is a usually mesenchymal tissue with a chondroid appearance and an epithelial component. No reports providing the MRI characteristics of benign chondroid syringoma were found in our search of literature, but the MRI appearance of a malignant chondroid syringoma has been described.4 This lesion was slightly higher in signal intensity than muscle on the proton-density sequence, had heterogeneously increased signal on the T2-weighted images, and had high signal with focal regions of intermediate signal on the short T1 inversion recovery (STIR) images. This benign lesion was slightly hyperintense relative to muscle on the T1-weighted images, had heterogeneously increased signal on the T2-weighted images, and showed heterogeneous but diffuse enhancement. Chondroid syringoma is a rare subcutaneous tumor composed of mesenchymal and sweat gland elements that is usually found in the head and neck. This tumor is most often benign and is usually seen in men. When the malignant form occurs, it is seen more commonly in women and is found on the extremities or trunk. When malignant, it can invade locally as well as metastasize to lymph nodes, lung or bone. 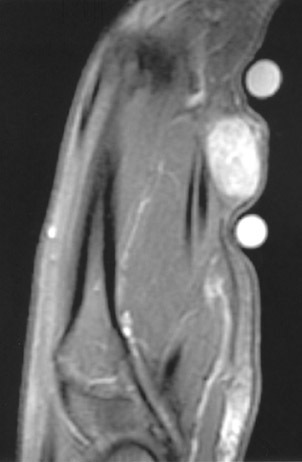 The MRI characteristics of the lesion are nonspeciﬁc, but could aid in identifying the extent of the tumor. Excision is the treatment of choice,thereby making early identiﬁcation advantageous. 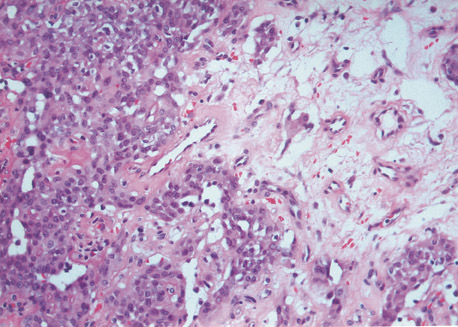 Importantly, the histology does not always predict the clinical behavior of the tumor, and benign-appearing lesions have been known to metastasize. Terrill RQ, Groves RJ, Cohen MB. Two cases of chondroid syringoma of the hand. J Hand Surg [Am]. 1987;12:1094-1097. Barnett MD, Wallack MK, Zuretti A, et al. Recurrent malignant chondroid syringoma of the foot: A case report and review of the literature. Am J Clin Oncol. 2000;23:227-232. Chen AH, Moreano EH, Houston B, Funk GF. Chondroid syringoma of the head and neck: Clinical management and literature review. Ear Nose Throat J. 1996;75:104-108. Nicolaou S, Dubec JJ, Munk PL, et al. 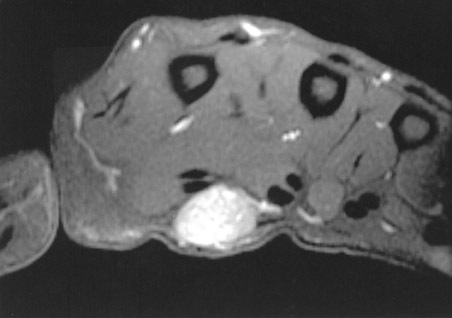 Malignant chondroid syringoma of the skin: Magnetic resonance imaging features. Australas Radiol. 2001;45:240-243. Benign chondroid syringoma. Appl Radiol.